The report, "ADVANCE DEPOSITS REMAINING FOR CANCELLATIONS & NO-SHOWS" should not contain any remaining deposits. If you see deposits on this report, you should read the following information so that you can clear them. Advance deposits should be zeroed out for all cancellations and no-shows. Prior to cancellation the deposit should be zeroed either by refund, cancellation fee charge, or both. For no-show reservations, the night auditor should always print the Expected Arrivals or the Arrivals and Departures Lists to find expected arrivals that have not shown up. If these truly are no-show guests the deposits should be refunded or forfeited using the correct codes. Refunds and forfeits are done in the same method as posting an advance deposit. This should be done prior to Reorganize Files on the audit for the arrival date of these reservations. 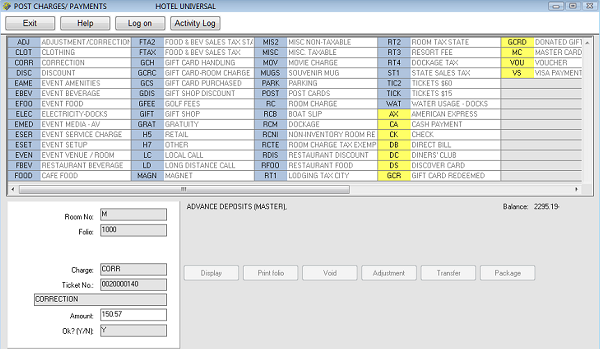 On occasion a reservation will get checked in but the deposit does not transfer to the guest folio. This can happen when you have network issues such as lost connections. This also can happen when you override a "reservation busy" or "record busy" message when posting the deposit or checking in the guest. After Night Audit Reorganize Files is run, the auditor will run "Update Advance Deposit Folio". Older systems may have "Reorganize Advance Deposits" or something similar; it is the same function. This program should never be run prior to Reorganize Files. Here is the report printed when "Update Advance Deposit Folio" was run after night audit Reorganize Files. Note that there is a deposit on this report. You need to clear it. The first thing to do is look for the reservation. Go to the reservation and zero out the deposit. If you do not see the reservation, then take the following steps. Make a note of the "CONF-NUMBER" as shown on the report as well as the amount. Make sure to observe whether the amount is a credit (with minus sign) or debit (no minus sign). Go to Post Folio or Enter Charges/Payments. Bring up the Advance Deposit Master Folio. Note: This is the ONLY time you should post directly to the AD folio. Enter the code you wish to use. If it is a charge code it will post a debit (unless you use a minus sign). If it is a payment it will post a credit (unless you use a minus sign). 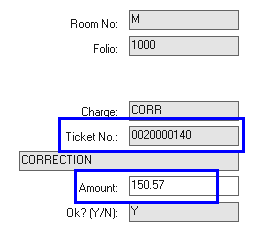 In the example above the charge code CORR is used. For the Ticket No. you must enter EXACTLY the number that printed in the "CONF-NUM" field on the report. Include the leading zeroes, as shown in the example above. For the Amount, make sure to enter a debit if offsetting a credit; enter a credit if offsetting a debit. If there is more than one line per confirmation number, you may do one entry for the SUM of all deposits for that confirmation number but make sure it is correct to the penny. Below is what the Advance Deposit Master Folio looks like after the offsetting posting. The first highlighted transaction is the original deposit. 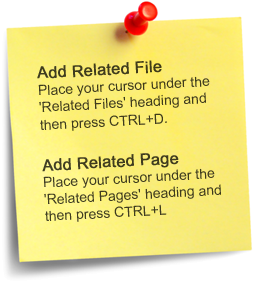 The second highlighted transaction is the offset posted with the method outlined above. After this has been done, the deposit should clear from the ADVANCE DEPOSITS REMAINING FOR CANCELLATIONS AND NO-SHOWS report. IMPORTANT NOTE: The ADVANCE DEPOSITS REMAINING FOR CANCELLATIONS AND NO-SHOWS report prints as part of a night audit function and is not intended to be printed at any other time. This program should never be run prior to Reorganize Files. Even though this menu item produces a report, it is also a program that does a function.